From a young age, Erik Abel knew what he wanted to do when he grew up: surf and create art. An avid artist by the age of one and a half, and captivated by his first wave at 11, the ocean and art have been the two most influential aspects of Abel’s life. 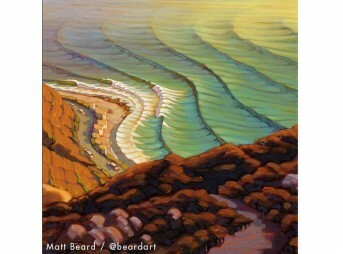 Over the past 15 years, he has achieved his childhood dream of surfing around the world, painting, and designing art. 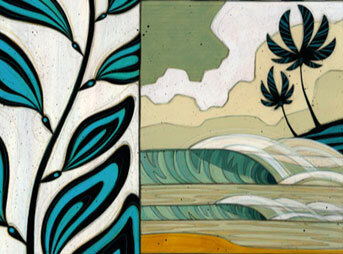 Abel’s art is recognized by his distinct waves, bold colors, and organic patterns. His roots as a California surfer intermingle with his experiences traveling to destinations, rich with native culture and imparting a tribal vibe to his style. Abel now lives and works a few steps from the sand on the Oregon coast. His original pieces have been featured in galleries across the country and abroad while his commercial work has attracted clients, including Patagonia, Reef, REI, Billabong, Sector 9, and Pottery Barn. Currently, Abel is focusing on giving back to environmental and humanitarian projects through nonprofit partnerships, exhibitions, and commercial projects. 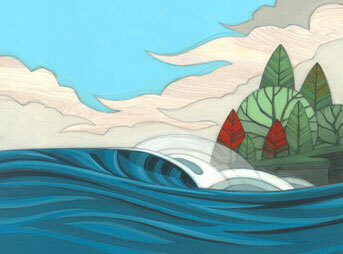 Original paintings, illustrations, and commercial design work can be viewed at abelarts.com.